How to host a Soup Swap (and slow cook your way to extra savings!) — Mindfully Spent. Last weekend, I turned two onions, two bell peppers, a small bag of potatoes, some frozen corn, a little coconut milk, broth, and spices into 14 big servings of delicious goodness that kept us eating a wide variety of hearty, healthy meals all week. This was not some loaves and fishes trick. The only magic involved was hosting our third annual soup swap. The first time I hosted a soup swap, I did it on a whim after learning about National Soup Swap Day (usually the third Saturday in January). The first year, everyone who participated was overjoyed to have a fridge and freezer full of home-cooked food. Filling our bellies with warm soup on the coldest days of the year was the best kind of cozy. We were hooked! Each person brings 6 quarts of soup individually packaged, labeled, preferably frozen, and ready to swap. Draw numbers to decide in who gets to choose first (and second, third...). The Telling of the Soup: Each chef describes their soup and what makes it special? Family recipe? Gluten-free? Vegan? Holy effing delicious? Made it on your first date night at home? The swap begins ! Participants each choose a container of soup in number order 'til everyone has gone 6 times. I keep my guest list on the smaller side because we usually all want to try all the soups we can get our hands on! Plus, our house is on the tiny side. Some soup swappers have guests bring a non-perishable food donation, so that those who are less fortunate in the community can also have a well-stocked kitchen after the event. I hope to add this feature next year. Click to read about a soup swap that that donates to local families on "Eat Like A Leach"
Did I mention that your fridge/freezer will be filled with amazingness?! A host can provide wine and/or tea to be shared. You can enjoy the company of some of your favorite cooks, and your bodies will be nourished by great food made by good people over the remaining weeks of winter. "What about restricted diets?" you might ask... In a household with one vegetarian, one person with massive food allergies, and one person who loves meaty foods, everyone in our house enjoyed some of the tasty options we drew during the soup swap. Creamy chicken gnocchi, ginger-spiced carrot soup with spinach and curry, roasted red and sweet potato soup, vegan gluten-free cauliflower gnocchi... In the course of three years, we find that everyone is pretty conscientious about who will be attending. Plus, those with limited options can choose the things that suit them on their turn. My soup swap submission was Slow-cooker Corn & Red Pepper Chowder. I modified this rich, hearty, and healthy recipe from Oh My Veggies. Even though I had to make a double batch to get all six quarts filled up, it didn't impact my grocery bill much... and that got me thinking our slow cooker as a way to meet our 2017 challenge to keep our grocery budget down. Don't forget it... Pin it! We already use our slow cooker often in the winter. I often refer to the slow cooker as our "house wife" because of how it greets us with a hot, ready-to-eat supper when we drag our weary bones home from work. The soup swap reminded me how thrifty these meals can be... and how the generous quantities (usually packed with veggies!) rustled up by a Crock-Pot recipe make great lunches and dinners for later nights. In a year when keeping our grocery bill will be one of the most challenging parts of our budget, slow-cooker soups will be a strategy we'll be using in the next few months to eat healthy while hanging on to our hard-earned dollars. Want to join us in saving money (and avoiding post-work dinner prep) with slow cooker meals? You can find some of our favorite recipes and a few ideas recommended by friends on Pinterest. Soup isn't your thing? You can still make your Crock-Pot work for you! 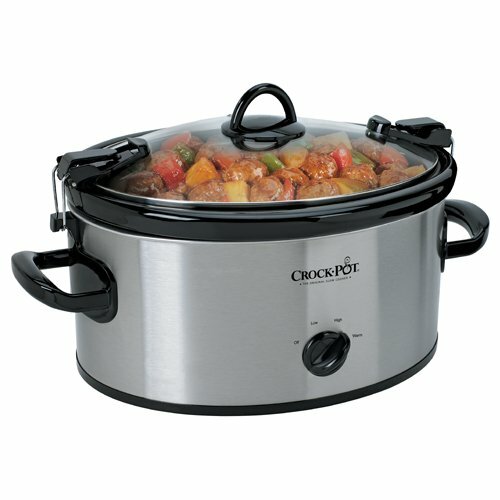 Slow cookers are a convenient way to make tender and tasty dishes from less expensive cuts of meat. In fact, the least expensive roast will make an amazing balsamic, brown sugar glazed pork (recipe on Pinterest!). Experienced slow cooker cooks even use them to make a week's worth of healthy breakfasts (Yes, this recipe is also on Pinterest!). We'll be trying out making lentils and maybe polenta in our rice cooker as part of keeping grocery costs in check in the weeks ahead, but we also welcome your tips! I hope your bellies have also been staying full of warm, healthy things. Is FOMO undermining your finances? Dec 1 Week 10 Wins: Six wins from a pay period of unexpected expenses.